Home Business The World’s Youngest Self-Made Billionaires! 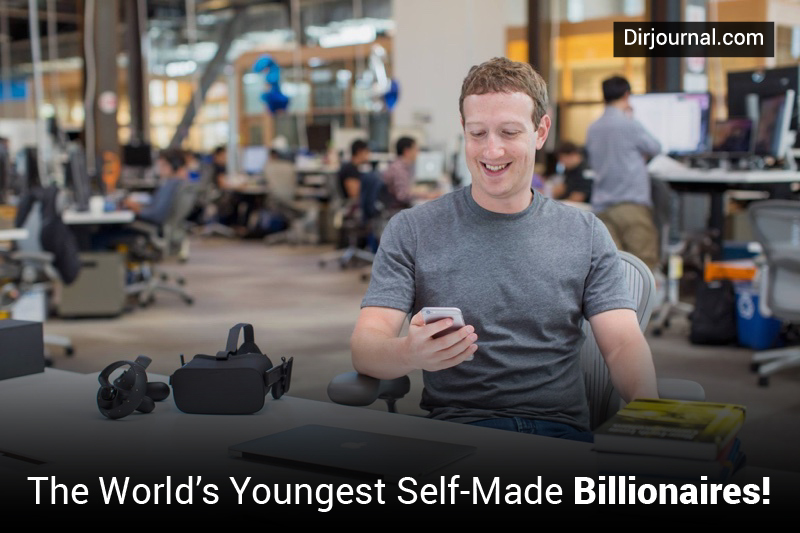 The World’s Youngest Self-Made Billionaires! Billionaires are getting younger! These young billionaires stand out amongst hundreds of billionaires in their age group. They are different from those that inherited their billions, because they started their own businesses and built them from ground up to reach the peak. Facebook has attracted more users than any other site can boast of. The founder is a young boy born on May 14, 1984 and named Mark Elliot Zuckerberg. This sky and reserved kid has an unparalleled brilliance. According to Forbes magazine, Mark Zuckerberg is the youngest billionaire in the world for 2008. He was born in a Jewish family and his father is a dentist. From his early years, he loved hacking into computers and wrote his own programs. He studied at Harvard, and the idea that brought him fame and money, a social networking site, was born in his dorm at Harvard, and the rest is history. His idea took fruition as Facebook, gaining unprecedented fame. He and his friend Andrew McCollum along with two other roommates, Dustin Moskovits and Chris Hughes started Facebook. Mark is the CEO of Facebook and his net worth is said to be $1.5 billion. Zuckerberg is the person responsible for the overall direction and product strategy for Facebook. He currently leads the design of Facebook’s service and development of its infrastructure and core technology. Xiaofeng Peng is a self-made billionaire with an estimated worth of $1.5 billion. Solar energy has been his ladder to success and wealth. When Peng was pondering the next move of his career, he realized that renewable energy is the future. Initially, he started out with a trading company in 2005, and it grew immensely to become one of the fastest growing suppliers of Chinese-made solar wafers in the world. These solar wafers are used in solar panels. His company, LDK Solar has also been listed on NASDAQ since 2007. He graduated from Jiangxi Foreign Trade School in 1993 and went on to earn a diploma in international business from Beijing University Guanghua School of Management as well as an MBA degree in 2002. Prior to founding this company, he also founded Suzhou Liouxin, which is a leading manufacturer of personal protective equipment in Asia. phase of expansion plans, LDK Solar has recently given a $220 million contract to Applied Materials Inc., for providing precision wafering systems. Peng states that he aims at making his company the largest and the most economic silicon wafer supplier in the world and he intends to do that both in terms of market share and sales volume. John Arnold was a go-getter from a young age. He is on the list of current self-made billionaires and his net work is estimated to be $2.5 bil. His father was a lawyer and mom was an accountant. He graduated from Vanderbilt University and after his studies, went on to work for Enron. He was 27 when he used Internet-based trading network to earn $750 million for Enron in 2001, when he was an oil trader for the company. He was rewarded $8 million in bonus. A year later, when Enron collapsed, he went into business himself and founded the hedge fund Centaurus Energy Advisors, LLC, based in Houston, Texas. For this, he is said to have used his $8 million bonus and other funds from selling his Enron stock just before its collapse. Sameer Gehlaut whose net worth is calculated at 1.2 bil, is the youngest and the 45th richest in India, and one of the youngest billionaires in the world. He established Indiabulls in 2000. His first step was the acquisition of Inorbit Securities, a stock brokerage company in Delhi. The group initially operated from a small office with a tin roof, near Hauz Khas bus terminal in Delhi. All they had was two computers. Fast forward ten years and the tin roof transformed in to a beautiful building on a 4000-acre land and the company has become one of the leading financial services and real estate companies in India. His educated consisted of a Mechanical Engineering degree from IIT, Delhi in 1995. As a young boy, he worked for Halliburton in the United States. He returned to India and started an earth moving and mining business, which is now taken care of by his family. He laid the foundation to his success when he started Indiabulls in 2000, when he was just 26 years old. He had help in the form of his two friends from IIT, Delhi; Rajiv Rattan Mittal and Saurabh Mittal, who are said to have a net worth of $500 million each. Indiabulls’ interests include consumer finance, mortgages, real estate, retail and power. The company’s market capitalization is a huge Rs. 25,000 crores. Page is a self-made billionaire and there cannot be anyone on the internet who hasn’t heard of him. He is the founder of the largest search engine, Google. He is ranked high on the list of billionaires with an estimated net worth of $18.6 billion. His background constituted of a computer engineering degree and a masters degree from Stanford University. Before completing this degree, he launched Google in 1998, along with his Russian born classmate, Sergey Brin, whose worth is said to be $18.5 billion. There is a small story that makes the rounds, saying that the two friends initially disliked each other until they eventually got closer due to their mutual interests. They even co-authored “The Anatomy of a Large Scale Hypertextual Web Search Engine,” which is like a bestseller in the web world. Google proved to be an extremely successful venture that has seen an increase in revenue exponentially. At Google, Page holds the title of the President for Products. Since Google went public in 2004, there was a huge increase in business. He is said to make a lot of money from the well-known online advertising program, Google AdSense and Adwords. Apart from Google, he also invested in Tesla Motors, which is in the process of developing a battery operated vehicle. The much-appreciated fact is that Page manages a $1 billion philanthropic organization and is known to spread his wealth whenever possible. Fortunes are made from being passionate about dreams. These self-made billionaires suggest that hard work, talent, the right attitude along with plenty of luck seem to be the vital ingredients to their huge success. A Nice description plus motivating too. Indeed the history been created by these people should be applauded. Let me here specially mention the name of Sameer Gehlot, the founder of Indiabulls Group who is really an inspirational face for Indians and the rest of the world. We are proud of him . He is a hero of Jat community. Johnnie Arnold is the real deal. He took out Jimmy Pulaski at Tudor and now runs the Natty market all on his own. Good on ya mate. we r proud of them also we motivate the job done. Great !! These guys are source of inspiration for us. For the most part, they’re all entrepreneurs barring David Rockefeller who inherited his wealth. These are all people actively running companies they’ve built. The average age among that elite group is around 80, though they remain active in the company with a few exceptions. theirs are inspiring stories that substantiate the principle of dreaming dreams and getting down to work to realize them as explained in the great classic, “Think and Grow Rich” by Napoleon Hill… kudos!!! that’s quite ispirational, considering the way these guys started. indeed, fortunes aremade from being passionate about dreams. i am coming soon to join these league. these guys have really proved the impossible is actually possible,this is a school of thought for graduates out there, that they should think of what they can do for their country not what their country could do for them……. As an Indian .. i admire the success of Sameer Gehlaut & his friends. .IndiaBulls Rocks. It is now obvious to every young person out their that, life goes beyond earning a degree….it is more of up-grading, and building the human capacity to deliver maximally…..you can do it go ahead………..
You have left the names of Anurag Dikshit and Vikrant Bhargava, both indians and IIT-D classmates who made it to the world’s youngest billionaires before Gehlaut, in 2005. They had the biggest flotation on the London Stock Exchange with a $10 billion IPO for Partygaming in 2005. They were 32 years old and were the world’s youngest self-made billionaires. but really think u r stupid and a loser! Vikrant Bhargava and Anurag Dikshit were the youngest self-made billionaires from India. Funny they all come from IIT Delhi from around the same batches. 1994/95. What was going on in IITD at that time? Very interesting and talented young people. From evolution to revolution. very inspirational and insightful, watch this space. I am inspired by these young billionares. Im the next young billionare, and this time from South Africa. I like Mark Zukerberg, he’s a true champ…… He Inspires young People like us. How come they’re all men?! Hey, if Mark Zuckerberg was born on May 14, 1984…. Doesn’t that make him 26 soon to be 27?? Just saying! i think that i should be a billionare and these other people should just really give up their money and again im really stupid i lie to my friends i brag alot and my real name is Somya Meka i live on 261 avon rd appt i 452 devon, pennslyvania, usa. This Guyz are sources of inspiration to this generation!!! Toms up…. I really like reading articles like this…they remind you to go for it and never give up. Well done Gehlaut! We r proud of U. This piece is a very nice article, and I so much believe this will be a challenge and a reminder to all youths out there that no matter what, we should pursue our dreams and actualise them for the better of the society and the world at large. It’s really inspiring. Kudos Hasan. Peace……! Sameer Gehlaut has now lost his mark.. He is no where in the list of Top 1000 richest people in the world. Let the bull phase come, he may outperform then.